Which is the Best Real Estate Website to Use When Selling Your Home? You want to expedite the sale of your home. For that to happen you have to use a website that displays as many real estate listings as possible. Not only listing count, but listing accuracy matters. Home buyers get frustrated when many of the listings they see have expired, been sold or are offered at a different price. Many people assume that they should use Zillow, Realtor.com or Trulia because they are the biggest real estate websites in the country. While these may help you sell your home they are not necessarily going to do it fast. It is okay to understand why may would be confused by this – they assume that size means success. This is not necessarily true. The way to sell your home as fast as possible is to make sure its on the local websites – which have all the LOCAL listings. The best way to do this is to use local broker websites – these are websites that contain IDX to display all real estate brokers’ listings. IDX allows REALTORS to share information and show each other’s listings, meaning that your listing will be cast far and wide. The wider the net that faster it becomes for you to get a buyer. 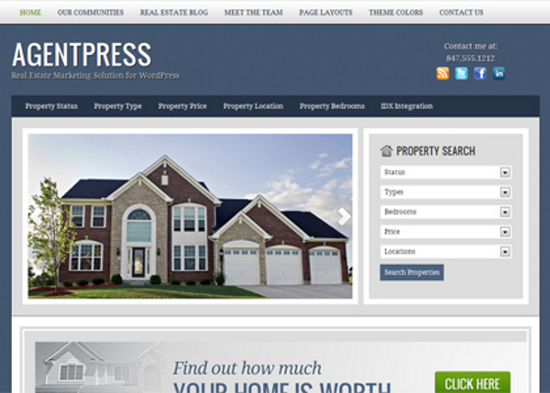 Its nothing new to find a real estate website that has property listings. One of the main factors that a website can provide to a potential home buyer is real estate market statistics. Providing timely statistics on real estate values, crime rates, absorption rate, level of inventory and schools is what keeps a potential home buyer on a website longer. Real estate market statistics provide real value. To go even further, some sites explain their real estate statistics. Another super useful feature that is gaining traction on the best real estate websites is explaining real estate terms. With all of the jargon used in a real estate transaction, explanation of real estate terminology is extremely helpful and can keep a user on the site longer. There are many real estate broker websites so you should be selective when you choose. Although when you add your home for sale to the local MLS – it should appear on all of the local real estate broker websites that participle in the MLS. The difference is, the broker that you list your home with — may display your home listing different. They may have a “featured listings” section of the site for instance. The best local real estate sites will come up in a Google search for localized real estate terms. Getting on page one of Google for real estate terms is not an easy process. That being said, when you see a real estate website ranking well on Google, it shows they have put a lot of time, effort and money into their site. Find one that has a reputation for fast and profitable sales. Remember, just because a sale is fast doesn’t mean it is profitable – you may sell fast because you are selling cheap thereby losing out. If you get 10 full price offers on your home in the first two days — your home may be UNDER PRICED. You want to sell your home for the best price possible so you want a shortlist of buyers who are prepared to offer you what you are asking or even higher if possible. Many real estate brokers have e-mails of potential home buyers that have signed up for an account on their site. This means that they have the potential to “reach out” to those buyers and let them know about your home now on the market. If you are not familiar with how to use these kinds of websites find a broker who is. Although many brokers use the websites we mentioned at the beginning there are others who understand that broker websites are the way to go and they are constantly exchanging information with other brokers about listings on these sites. What are the Best Real Estate Websites to Sell My Property?